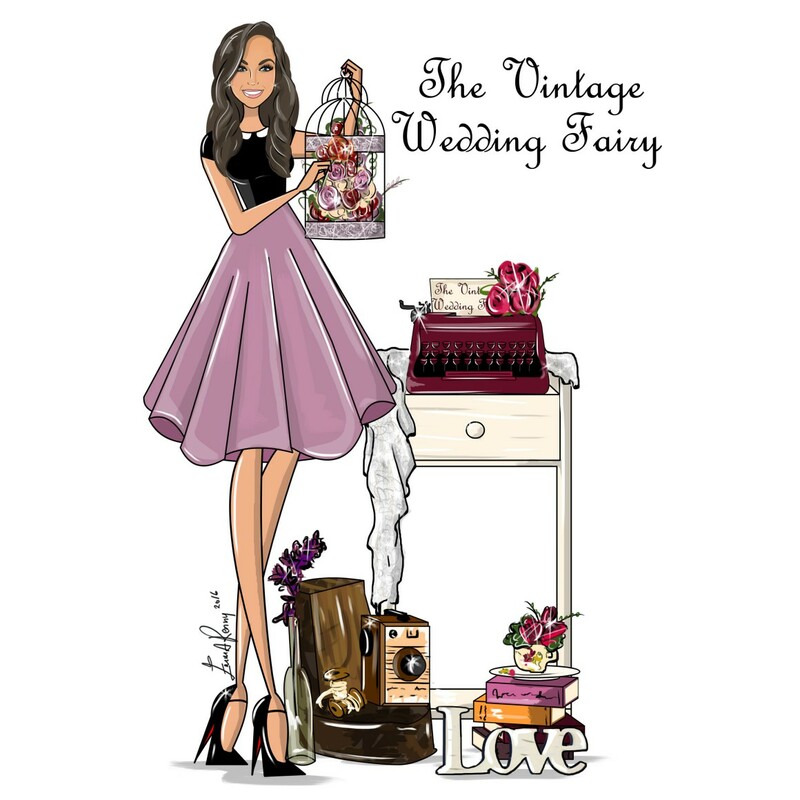 Hi I'm Leanne, The Vintage Wedding Fairy! 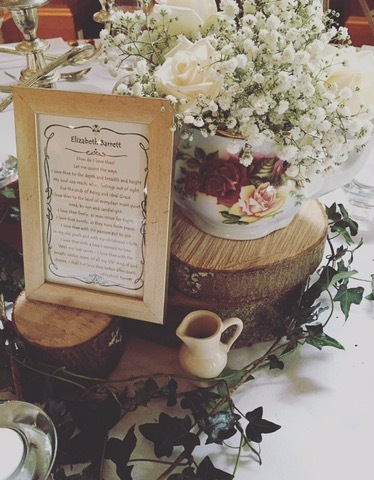 I am a qualified Wedding Planner and Event Stylist, specialising in Vintage décor & prop hire. Whether it's styling your big day with romantic vintage props, assisting you with the planning or simply being there on the wedding day to act as a personal assistant (or wedding fairy if you will) there is no task too big or too small. Just contact me to arrange a consultation and lets get planning your perfect day! 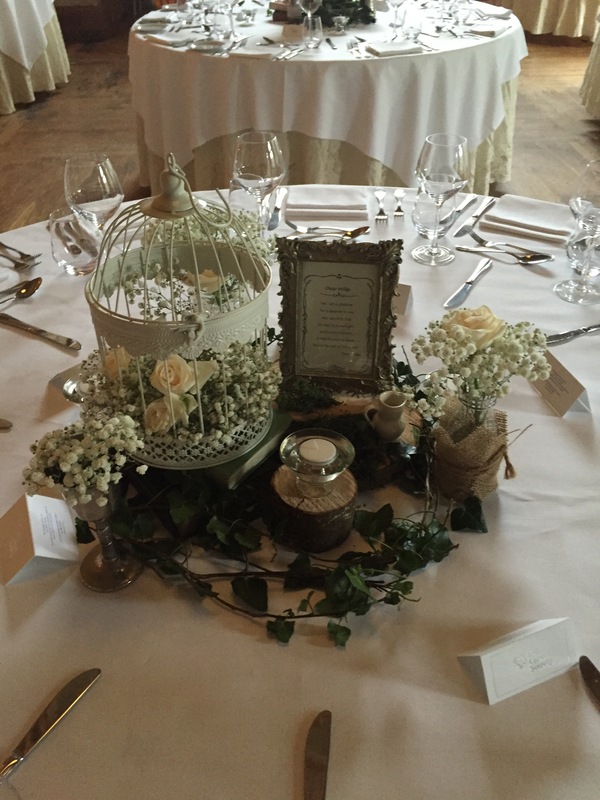 Ciara & Grahame celebrated their special day in the beautiful Step House Hotel in Borris, Co Carlow on 27th April. I absolutely adored styling this wedding and working with Ciara & Grahame (who were actually my very first booking at my first wedding fair, thanks guys!) The colour palette throughout was soft pinks and lavender which made for the prettiest of photos don’t you think? 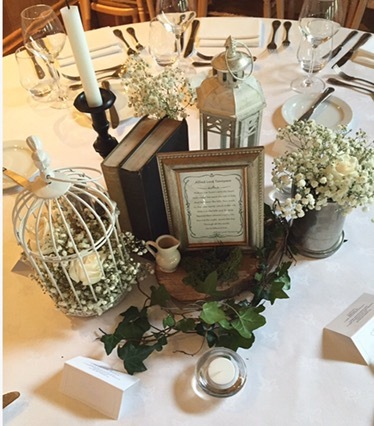 For the centrepieces I used mostly bird cages and pretty tea pots to showcase the flowers and stacked old books with lace placed on wooden rounds. 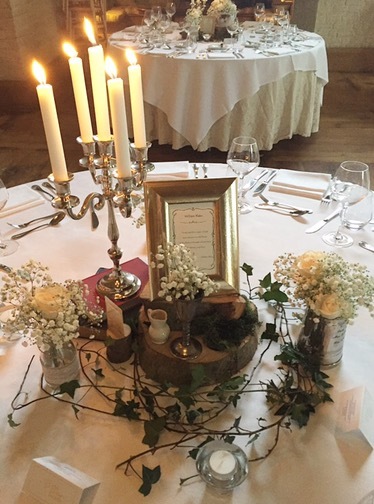 The table plan was displayed in an old vintage trunk with ivy and flowers while the table numbers were in fact handmade by Ciara herself! Ciara’s father handmade each individual place name with wooden scrabble pieces, assembled on a little rack, such a lovely personal touch. They also doubled as wedding favours for each guest, genius! 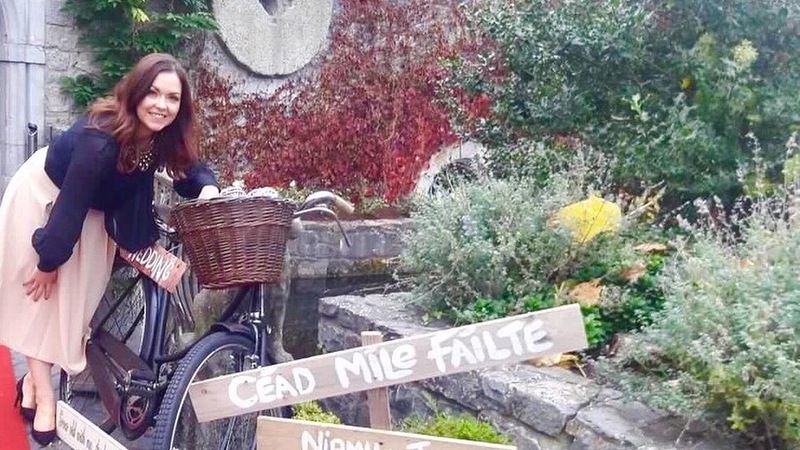 The gardens of The Step House Hotel are absolutely beautiful and hosted the perfect setting for the two High Nelly bicycles which I styled with props and flowers. I absolutely loved being a part of Ciara and Grahame’s big day. Thanks guys! Wishing you a lifetime of love & happiness. Childhood sweethearts Lisa & Keith celebrated their wedding day in the enchanting surrounds of Darver castle in Co Louth in November 2016. The couples fun loving, laid back style shone through on the day and made this a dream wedding for me to style. 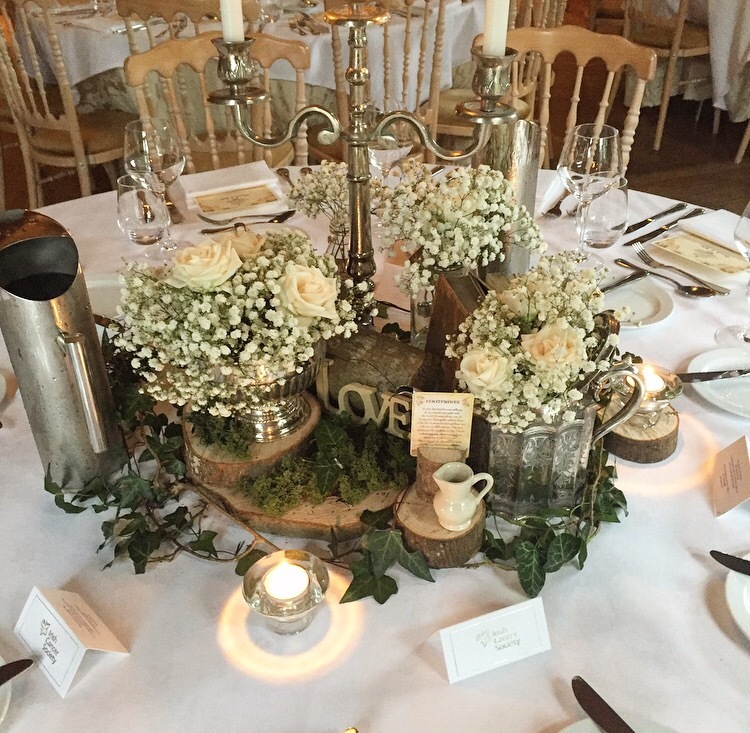 I combined wooden rounds with Ivy & moss as the foundation for the table centrepieces and then stacked beautiful birdcages, old books & mason jars to build a unique feature on each table. Old Hendricks bottles featured as an ode to the couples favourite drink, and let’s face it, made for super pretty pictures! 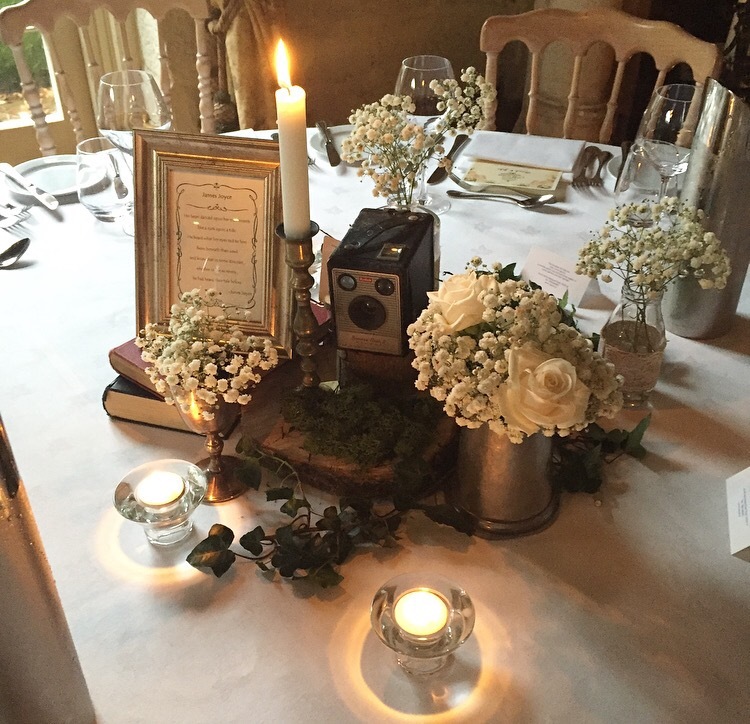 For the top table I combined bell jars & mini picture frames, old books and candelabras. 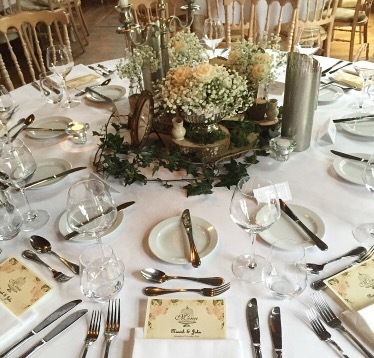 Darver castle dressed the tables with gorgeous lace tablecloths and vintage cutlery, the perfect canvas for my centrepieces. I created a personalised feature wall in the banquet room as a backdrop for photos, and also just because! 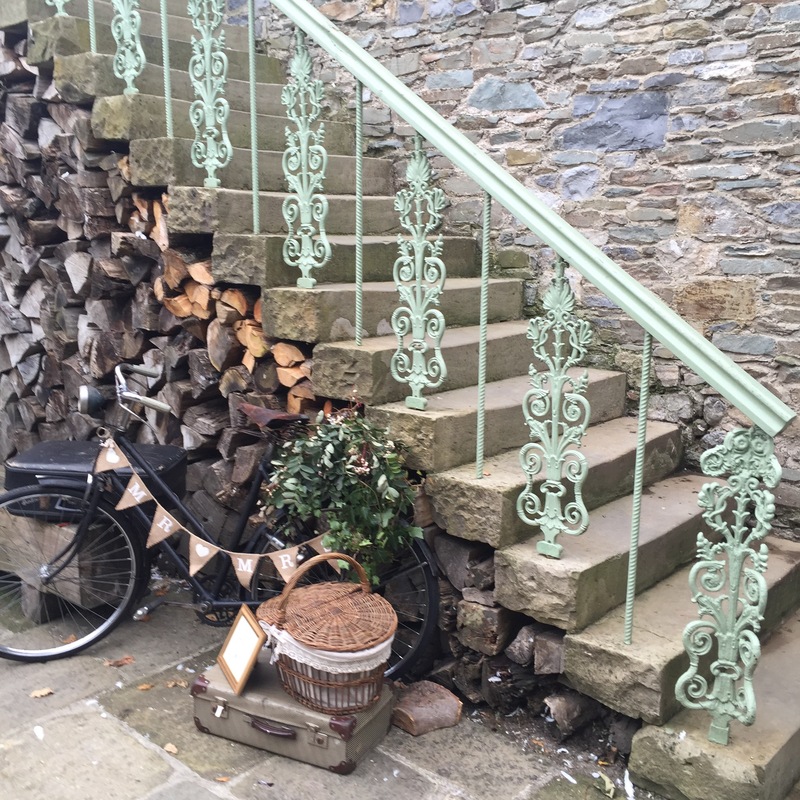 I stacked wooden crates & logs, pillar candles,bell jars and more Hendricks bottles & teacups. 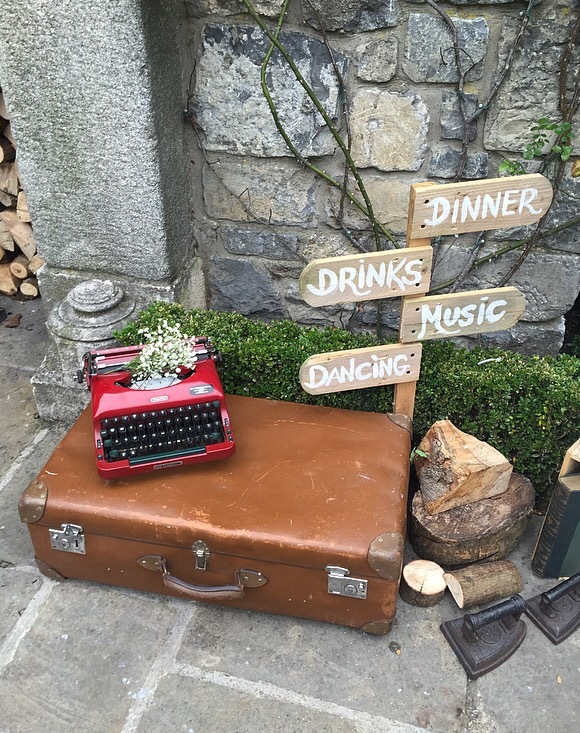 A rustic directional sign and old singer sewing machine were the main feature along with a personalised ladder of photos of the couple and their favourite quotes.This was a lovely touch and a total surprise to the bride & groom on the day. 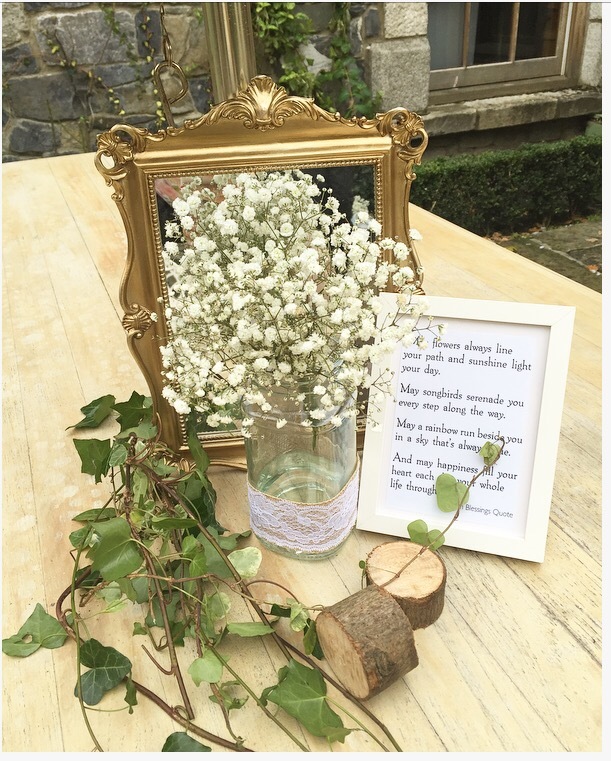 Little quotes, love notes and photographers of the couple were dotted around the venue accompanied by mason jars & milk bottles filled with flowers. I chose the trunk tableplan for Lisa & Keith as it fit in perfectly with the charming medieval style decor of Darver castle. I put it sitting next to a full suit of armour! Nothing screams castle wedding like a knight in shining armour!! Their drinks reception was held in the fab conservatory area where we cleverly featured a candy station, prosecco bar and tea & coffee station! How cool is their cake?!! Best Day Ever – It really was !! Where do I start? Niamh and John’s wedding last month in the stunning Cliff at Lyons (formerly Village at Lyons) was the stuff of fairytales. Living in Australia and planning an Irish wedding, the couple wanted a little help with the coordinating & styling so they contacted me. The rest as they say, is history. 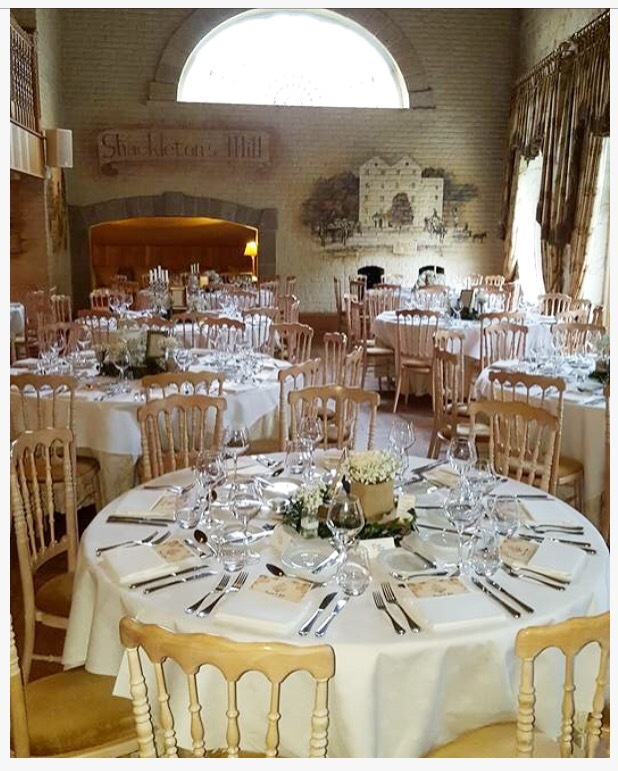 The Cliff at Lyons in Kildare is a stunning venue and the absolute perfect setting for a vintage wedding! The couple wanted a 1920’s vintage glam wedding with rustic Irish charm, and that’s exactly what they got. The ceremony took place in the nearby chrurch in the village of Straffan. 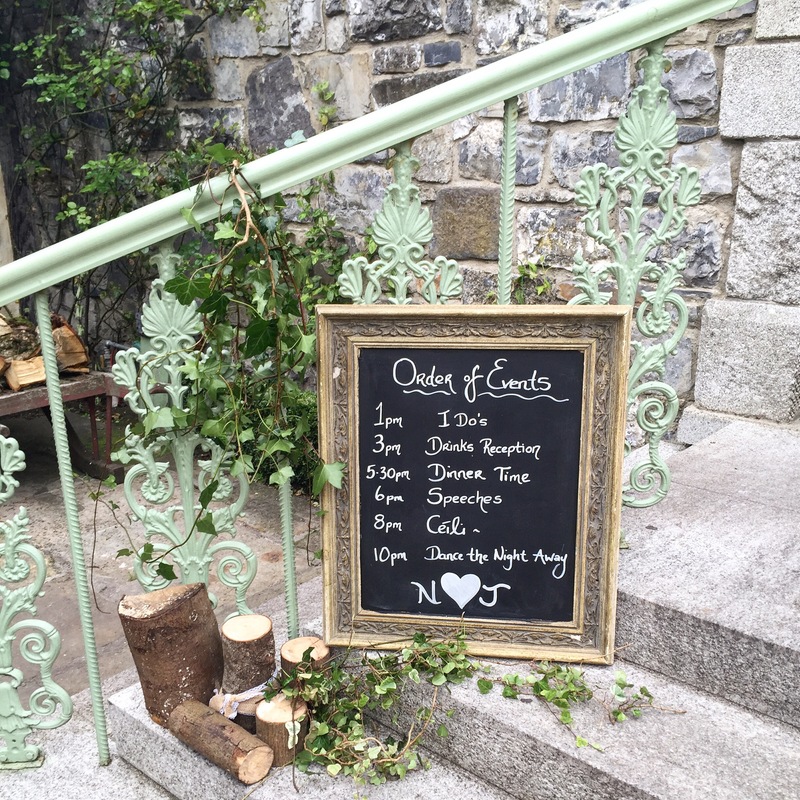 My high nelly took centre stage outside the church styled with vintage props and lots of Ivy! Niamh, a local Kildare woman and John hailing from the land down under wanted their guests to experience a ‘real Irish wedding’! They booked a Ceili and trad session for their drinks reception which was fantastic, it really set the tone for the day. Niamh’s mum was a teacher with a love for literature and the Irish language so I dotted lots of Irish quotes and blessings around the venue as a little tribute. 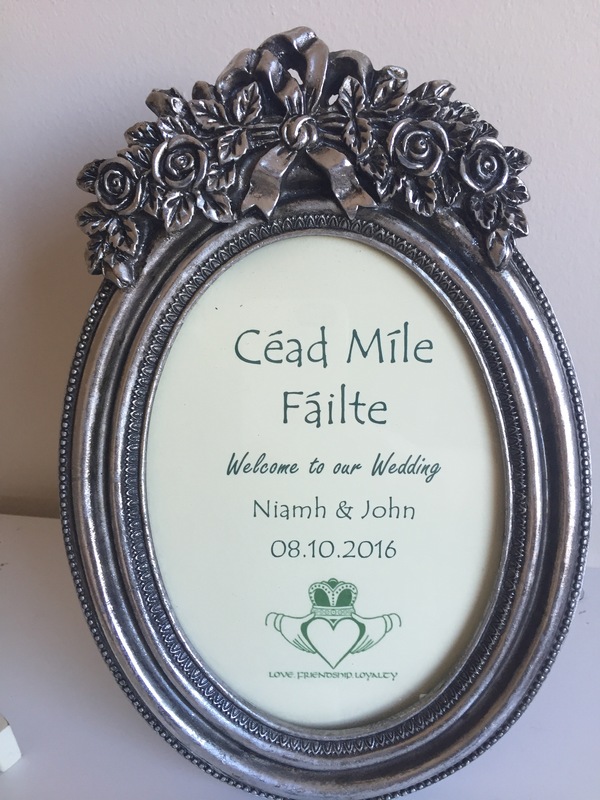 For their table plan Niamh & John chose famous poets & writers from both Ireland and Australia instead of the usual table numbers. This was a real talking point for the guests as they read aloud the poems & quotes as they waited for dinner. 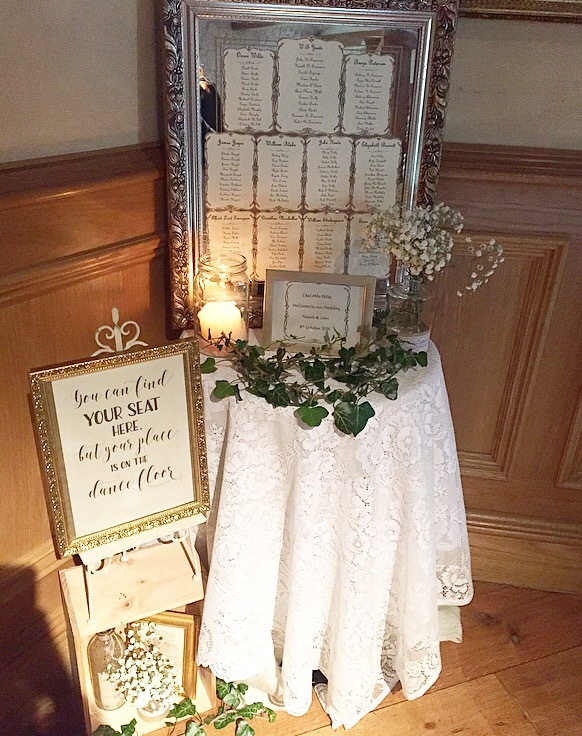 I used a gorgeous gold vintage mirror (my grandmothers) on a lace table and a cute sign “you can find your seat here but your place is on the dancefloor” as the table plan directing guests to their seats. I styled the tables with wooden rounds, antique candelabras, birdcages, stacked books, vintage teapots and silver goblets and mason jars wrapped in burlap and lace. 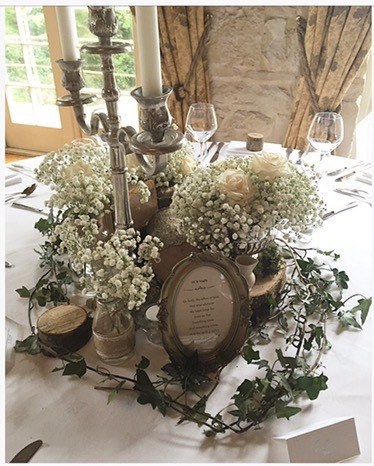 For flowers, I kept it simple with baby’s breath, cream roses and loosely scattered Ivy. I was absolutely thrilled at how they all turned out, each table was unique and individual and totally and utterly gorgeous! This cake table was like no other! Niamh wanted to pay tribute to her parents by transforming her cake table into a little corner we named “Essie’s Cake Corner”. With her mums recipes we had butterfly buns and apple tarts along with her gorgeous cake made by her wonderfully talented cousin Gemma of GB Sweet Temptation Cakes. I displayed Niamh’s mums vintage China and a poem she wrote about her home town “Ode to Straffan” which Niamh actually read aloud in her speech, it was so lovely. 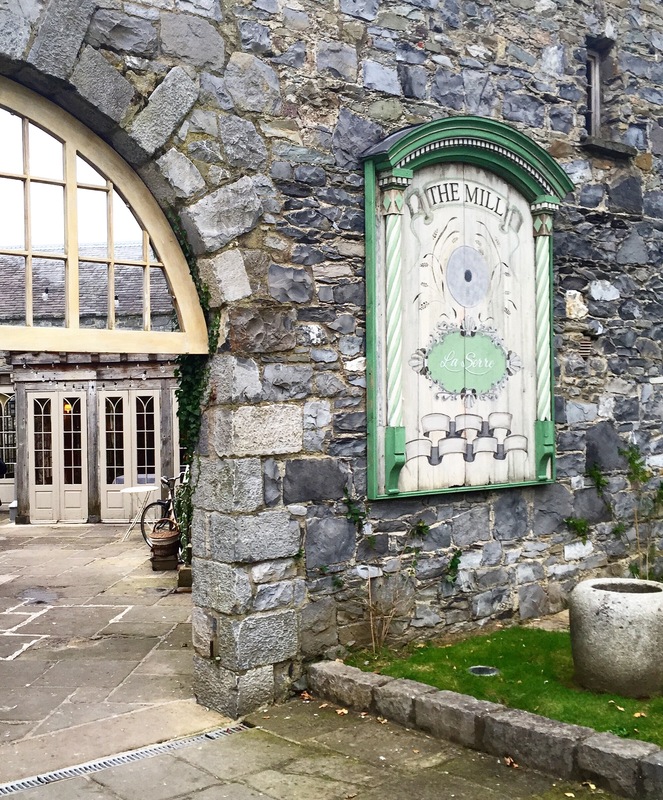 One of the (many) things I love about the Cliff at Lyons is their little courtyard or ‘The Mill’ just outside the dining room. I had lots of fun styling this area! 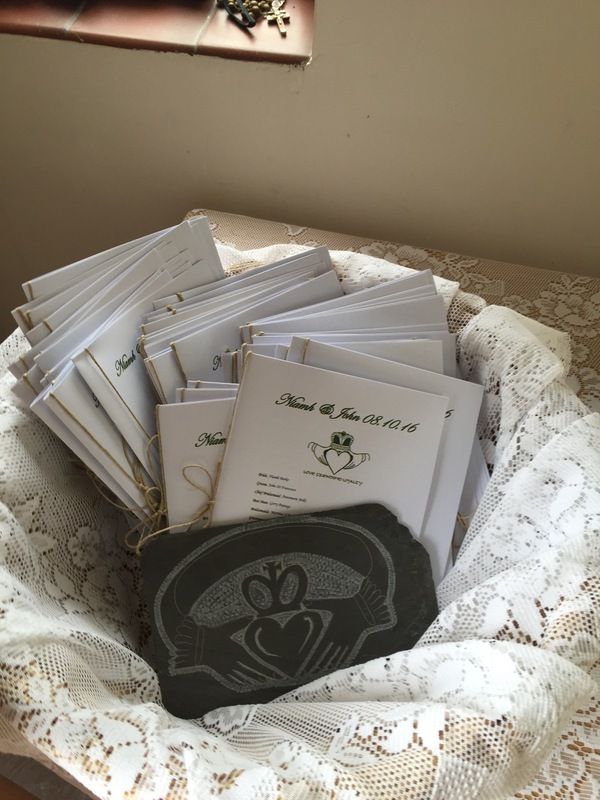 For wedding favours Niamh & John made a donation to The Irish Cancer Society. 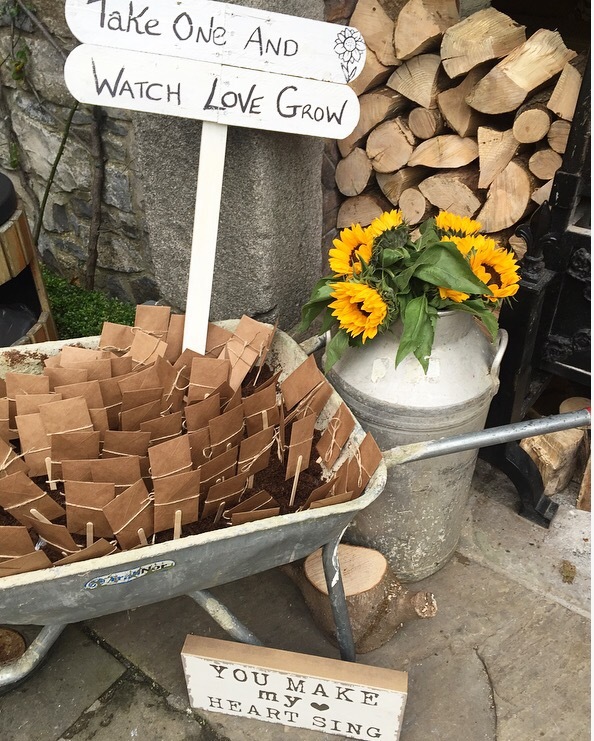 They still wanted to give her guests something to take home so in a wheelbarrow with a sign that read “take one and watch love grow” the guests were given sunflowers seeds wrapped in little brown envelopes and tied with twine. This was such a lovely idea. Order of Events, because we all love a good schedule! The rustic setting in the Mill. 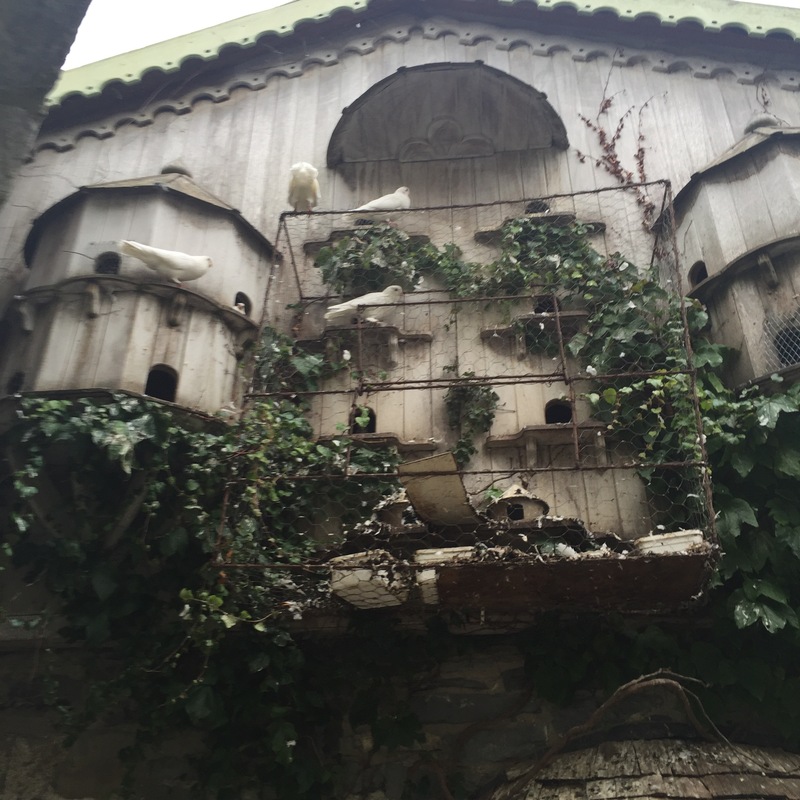 Complete with resident doves. Fairytale stuff really. 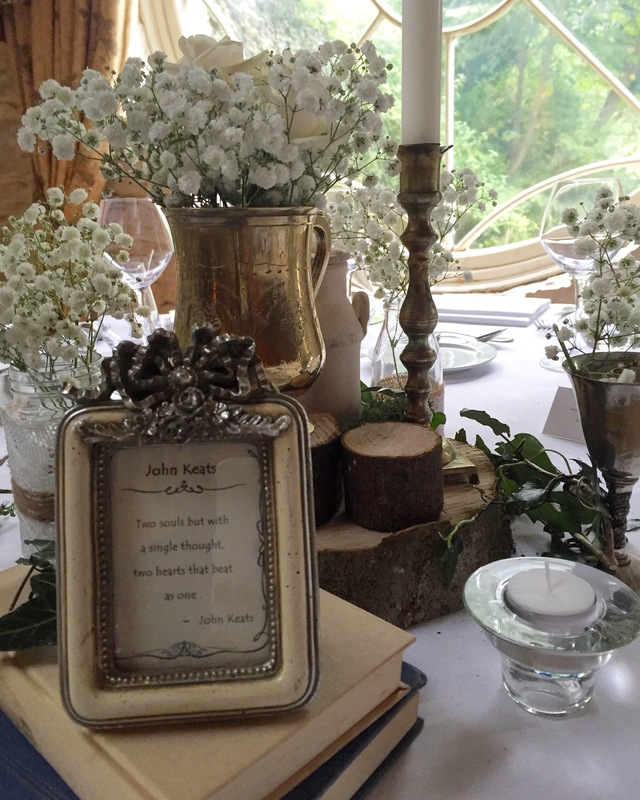 Not only did Niamh & John want me to style their vintage wedding they availed of my super organised-obsessed-with-weddings personality and hired me as their “On the Day Wedding Planner”. Planning the big day from Australia was proving a little stressful so they wanted someone on this side of the pond to help with the last minute planning and changes. Someone to liaise with the venue and suppliers and take the reins to manage their wedding day. Enter The Vintage Wedding Fairy! I met with Niamh & John when they flew back to Ireland for their month long celebrations and we hit it off from the get go. Such a wonderful couple. Niamh & I discussed all the details of the day and exactly how she wanted it to go. John’s lovely laid back Australian nature meant he was happy with Niamh & I taking charge and making the decisions! Niamh really wanted a stress free day where she and John could really relax and enjoy it all knowing it’s taken care of. My job was to ensure that everything ran smoothly and the bride and groom and their guests were having a great time. On the day of the wedding, once the styling was done I was essentially Niamh & John’s personal wedding assistant, taking care of everything from welcoming their guests, looking after their cards & presents, lighting the candles, looking after the suppliers and ensuring they know what’s happening and when, coordinating the ceremony and timings of the day, helping Niamh tie up her dress before the first dance so she wouldn’t trip up, running to get her flats when the feet were sore, those kind of tasks. Traditionally, the bridal party look after these little things but Niamh wanted her girls to relax and enjoy the day with no worries or duties, sure that’s what I’m here for! 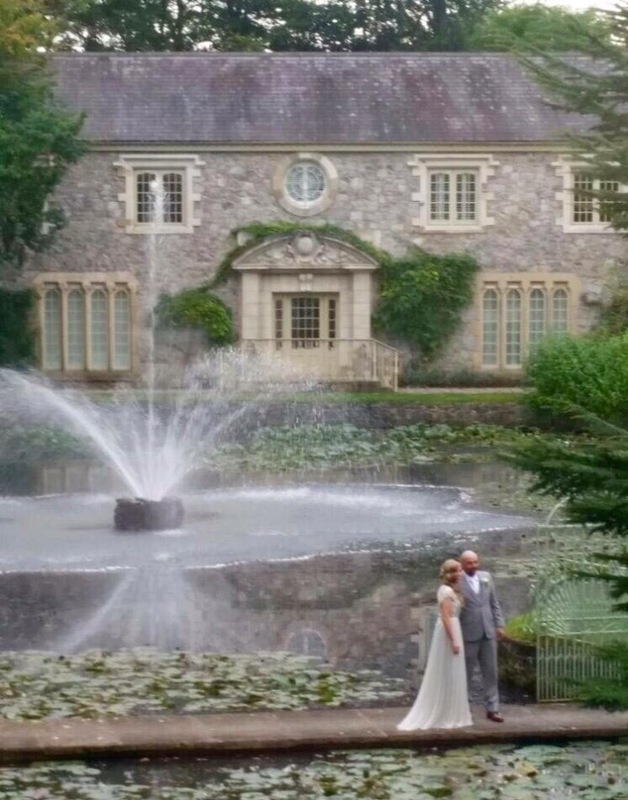 It was such a pleasure to be Niamh & Johns wedding planner on the day and to create a wonderful stress free day filled with love and laughter. Such a wonderful day with an amazing couple. I really wish we could do it all over again. How stunning is Niamh and her girls? Those dresses! 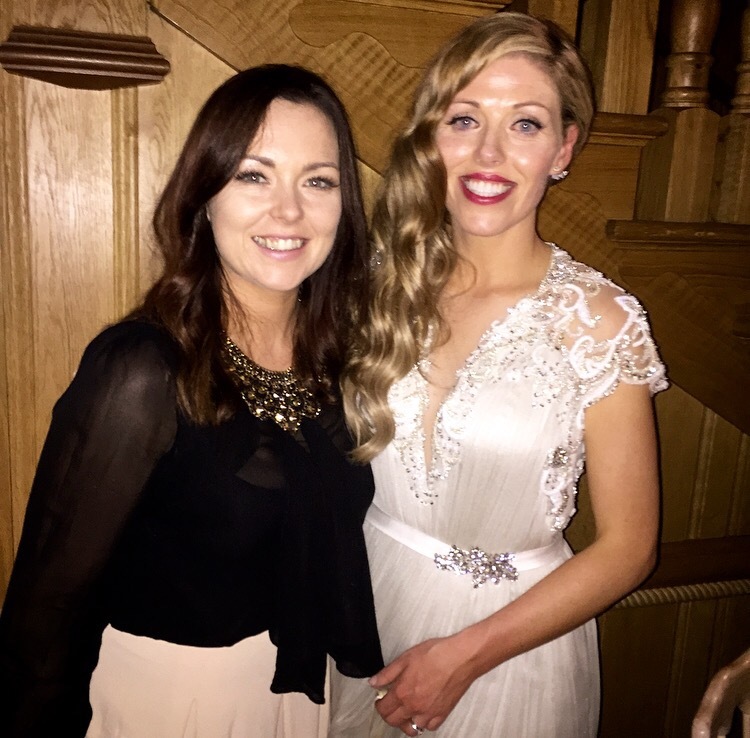 Her dress was a beautiful vintage beaded gown from Ealu, a fab boutique in Naas. It was so stunning, the back was completely embellished with beads and lace. 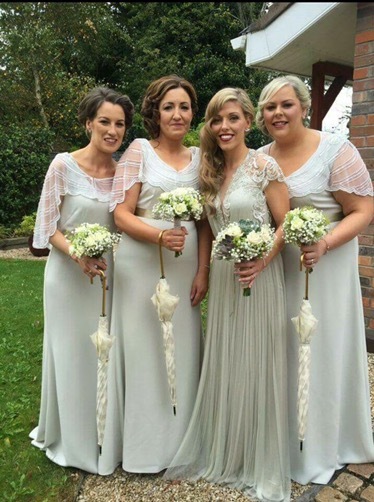 The bridesmaids wore gorgeous customer made pistachio colour gowns from a designer in Dublin, with gorgeous cream beaded cover ups and beautiful umbrellas that the bride picked up on her travels in Tokyo! Make up by the super talented Hayley McGowan and hair by Mandika hair studio. 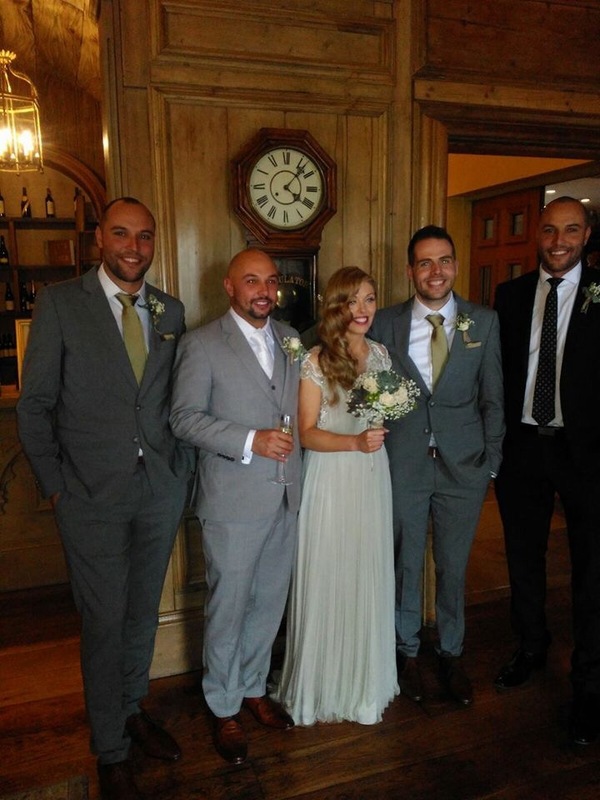 What a stunning bridal party! 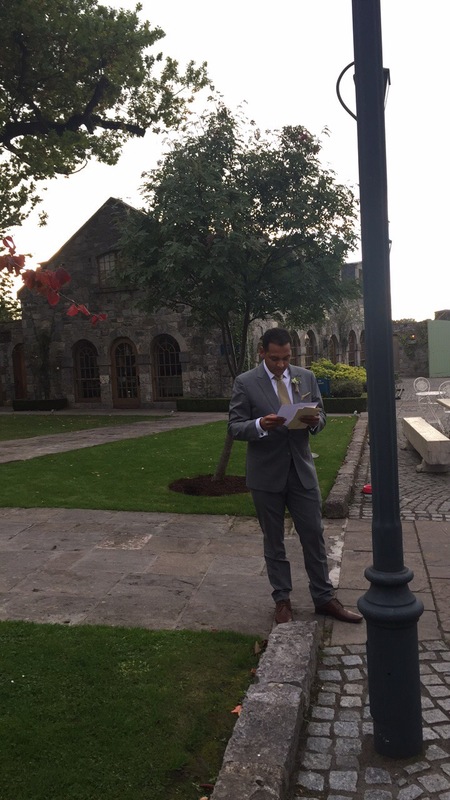 I love this shot I took of the best man Gerry taking a minute alone to reherse his speech! Leanne truly is The Vintage Wedding Fairy/Angel. I dont think I would have made it up the aisle without her, no task was too much, she was responsive to our every need. It is obvious that Leanne loves what she does, her excitement is catching, yet she is calm and collected and puts you at ease the whole time! 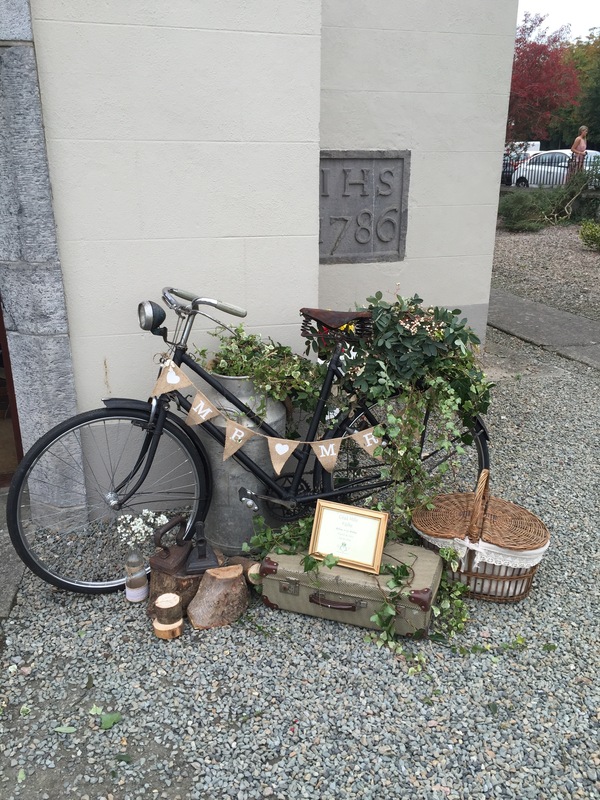 Our guests were amazed with the styling from the vintage bikes at the church, the old wheelbarrow with “watch our love grow” seed packets, the styling at the hotel entrance, the table decor and the most amazing cake table I have ever seen! Leanne listened to every request and made it happen, she helped make the occasion extra special by helping weave in little tributes to my parents. Today I attended the Wedding Showcase held in the Westgrove Hotel in Clane Co Kildare. Lucky for me this beautiful hotel was just around the corner so it was familiar territory. I always love the buzz of these small wedding fairs and open days, they are so much more intimate and cosy than the large scale wedding exhibitions. 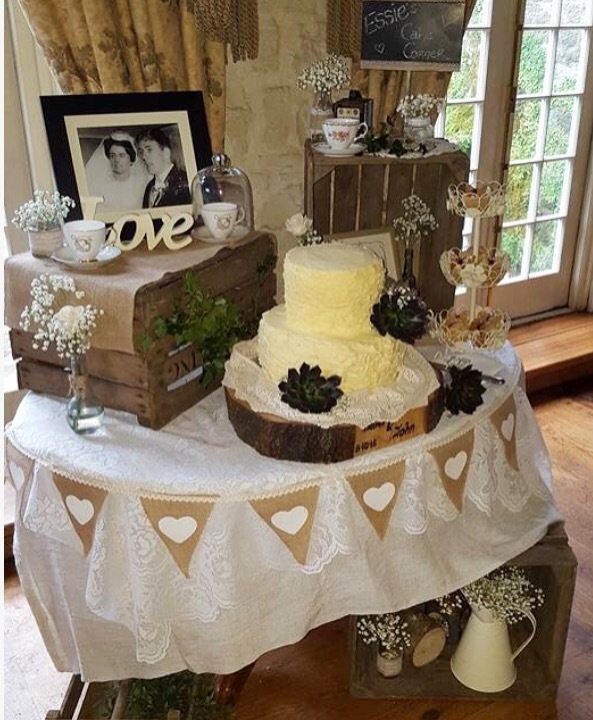 Here are some images of my gorgeous display, it certainly attracted some attention and was a great source of inspiration to plenty of snap happy brides! It was so lovely chatting to everyone and meeting other great wedding vendors. 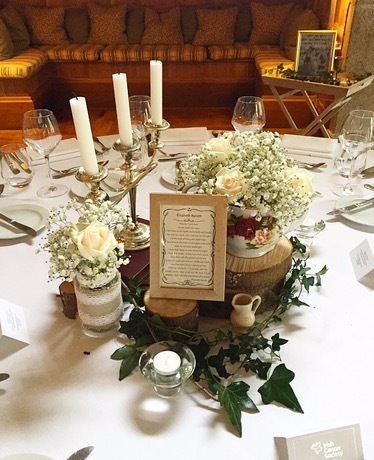 As a newbie to the wedding industry it was great to get some advice from other suppliers. and just have the chats! My next fair is a big one… The Spectacular Vintage Wedding Fair on Sunday Sept 18th in the Davenport Hotel, Dublin. An entire wedding fair dedicated to Vintage Weddings, I will be in my element! If you’re planning a vintage/rustic style wedding then The Spectacular Vintage Wedding Fair is one not to be missed. If you are there, pop over and say hi I’d love to meet you. We can discuss your wedding, your ideas and of course the most important factor – your budget. Tailor made packages available so get in touch to arrange a consultation! Hi I’m Leanne, The Vintage Wedding Fairy! 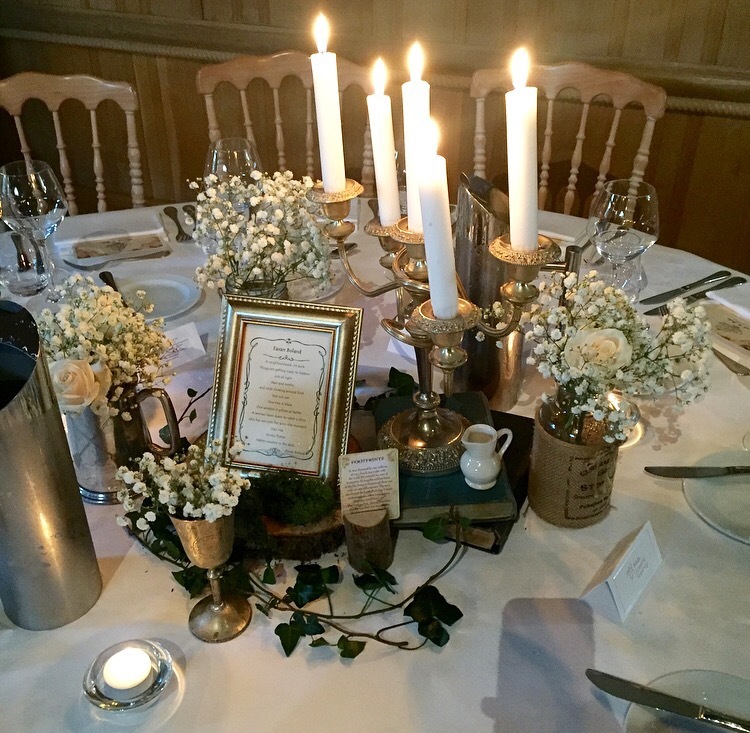 Whether you need help with the styling & décor of your wedding (have a look at my range of gorgeous vintage props) or a little assistance with the planning and coordinating, I am here to help. I can act as your very own wedding assistant (or wedding fairy, so to speak) taking care of the little things, from making sure every candle is lit, to fixing your dress, to coordinating your vendors on the day of your wedding. Allow me to do the hard work while you relax and enjoy your engagement and the lead up to the big day. As a qualified dance instructor I can also take care of your Wedding Dance. If its a traditional dance you’re after or a fun dance to wow your guests we can work together to choreograph a real showstopper! I can also assist in the styling of Vintage style Baby Showers, Afternoon Tea Parties, Vintage Hen Tea Parties, Vintage Bridal Showers.